A wizard designed to recover accidentally deleted files from existing logical drives. Select at least one logical drive to scan for deleted files. Scan selected logical drives for deleted files and folders. The scan can be stopped at any time. Use the File Filter Toolbar to narrow down search results. By default, only deleted Files and Folders are shown. To view all files detected on scanned devices, click the Reset filter to default button in the toolbar. Select file(s) to recover and click Next to continue. Names of detected files will be preserved only if no file with that name exists in the destination directory. All files will be renamed by their given specified file root name and added enumeration ID. The file's extension remains intact. If a file with the same name exists in the destination folder, files with a unique name will be generated to avoid overwriting. If a file with a certain name already exists in the destination folder, the application will ask the user what action to take. All files will be overwritten in the event they already exist in the destination folder. If file with the same name exists in the destination folder, the recovery of a new file will be skipped. 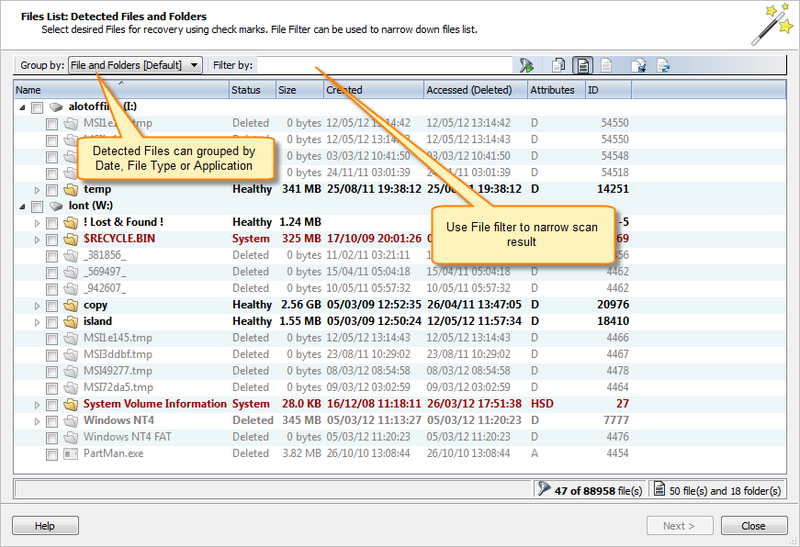 When this option is selected, files will be recovered with their original folder structures e.g. the original folder hierarchy as it was on the source storage device. In case the files were organized in groups (by date, file extensions, or an associated application), then such groupings will be created by the folder structure in the location where the files will be recovered to. 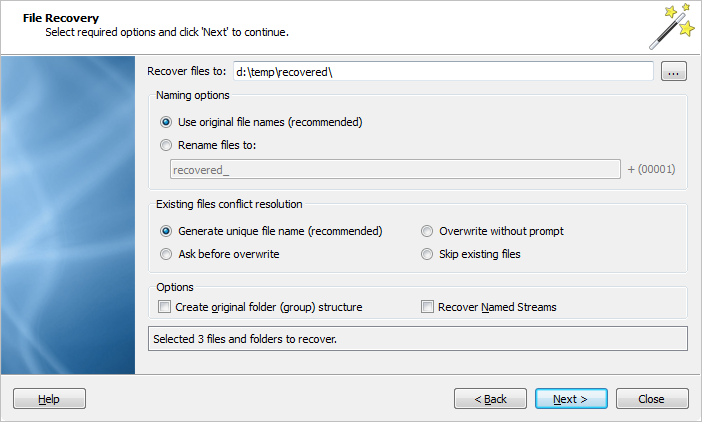 With this option on, files will be recovered with their original named streams. Verify default recovery options and click Next to continue. Review recovery options, destination path etc. and click Recover to start recovering files. Click to close the Wizard. After the recovery wizard has completed, you can open the destination folder to which the files were recovered. Use the default OS File Explorer or repeat the wizard again to scan another logical drive. All scan results will remain available after the wizard closes. © 2019 LSoft Technologies Inc.